Winner: Ronald Lu & Partners (Hong Kong) Ltd.
China Resources Building (CRB) was erected in 1983 and to demolish such a contemporary icon would be to take away a vital part of the city’s skyline. Instead, this renovation acts as a catalyst for urban improvements in Wanchai North and shows that greening an existing office building is technically feasible and cost effective. 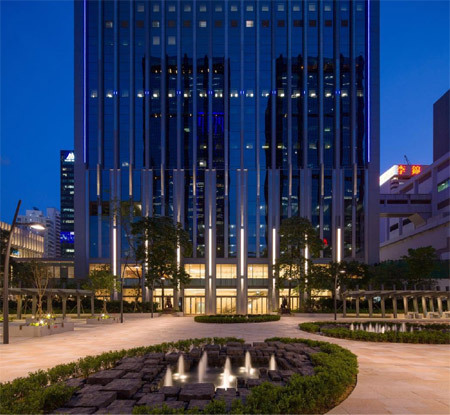 CRB is the first renovation project to achieve LEED Core & Shell Gold Rating in Hong Kong. Not only will the greener CRB reduce cost and energy consumption, the improved air quality provides a better interior environment for its users. To attain such a green icon, both the design and construction consideration play an essential role during the renovation process. The tower’s original skin of white mosaic tiles is being dressed up by a new curtain will to reduce solar gain. Only 5% of solar energy will be transmitted into the interior and lead to a reduced cooling load for improved energy efficiency. Materials of the new curtain wall are regionally manufactured thus minimizing the carbon footprint resulting from their transportation. At the same time, the project world reuse 95% of its existing structural walls, floors and roofs to extend the life cycle of the building stock. The adopted construction waste management plan would recycle at least 50% of non-hazardous construction and demolition waste from disposal. Shaded areas, solar reflective paving and a new podium garden will reduce the building’s contribution to the heat island effect.